This is the guitar method students and teachers have been waiting for. Learn barre chords with songs like “Stairway to Heaven” and “Drive My Car,” the minor scale with riffs by Eric Clapton and Iron Maiden, blues concepts with songs by Stevie Ray Vaughan and T-Bone Walker, and much more. 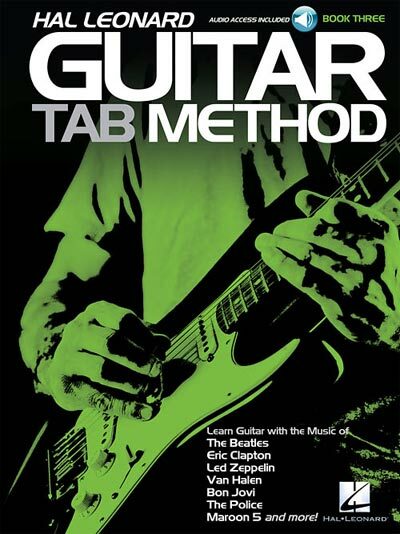 The method's unique, well-paced, and logical teaching sequence will get students playing more easily than ever before, and music from popular artists like Jimi Hendrix, Michael Jackson and Ozzy Osbourne will keep them playing and having fun. Book three includes easy-to-follow guitar tablature • barre chords • minor scale • relative minor • Nashville numbering system • 12-bar blues • blues scale • blues licks & turnarounds • 12/8 time • add and sus chords • minor seventh chords • minor blues • variety of music styles • nearly 80 riffs and songs • audio demos of every example • and much more. The price of this book includes access to audio tracks online, for download or streaming, using the unique code inside the book.